The Promise, The Movie starring Oscar Issac, Charlotte Le Bon, Christian Bale and Angela Sarafyan showcases a love triangle much like Romeo & Juliet’s according to actor Marwan Kenzari in an interview at the Toronto Film Festival. The love story takes place as the historic drama unfolds in the Ottoman Empire as the Armenians start being deported from their villages and homes. There are two love stories according to Sarafyan, who plays Maral, stated in a Charlie Rose Interview on 4/20/17. There is the love story of Maral & Michael who are betrothed and then get married and there is the love story of Michael and Ana, an Armenian Parisian whom Michael meets in Constantinople when he lives there to study medicine. Our Envelope Addressing Calligraphy is inspired by the married love of Micheal & Maral although it could also be between Ana & Michael or even between Christian Bale’s character, Chris & Ana. The above calligraphy is printed in Madina Script in black ink using Hyegraph Calligraphy. 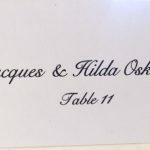 The names read Mr. & Mrs. Michael & Maral Boghossian and the Address reads Watertown, Ma. where Michael ended up living with his only surviving relative Yeva in the Movie the Promise. Although neither Ana nor Maral made it safely to Watertown, the calligraphy above is in memory of their betrothed and tragic love story. 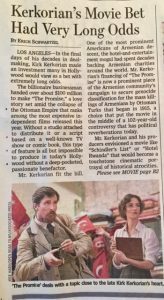 The above article published in the WSJ, written by Erich Schwartzel, discusses Kerkorian, an Armenain/American Mogul, and his love for creating the Movie The Promise released by Survival Pictures. The movie is also a movement #keepthepromise. The article points out that the movie is not a financial success lacking the ROI, however, as Mr. Esrailian, one of the movie’s producers points out, it was never meant to make money. The movie was meant to educate people about the Armenian Genocide. In fact, the proceeds from the movie are 100% donated to charitable organizations to help educate about the topic of genocide. Not only the Armenian Genocide but all Genocide. One such action is the UCLA’s Promise Institute created partly by the proceeds from the Promise. The Movie The Promise is in theaters now. To see more on keeping the promise please see our Keeping The Promise Blog. To see more Armenian Inspired Invitations & Designs please see our Armenian Invitations Category or our Pinterest Page. If you would like Hyegraph Invitations & Calligraphy to create elegant Calligraphy for your addressing or invitations, Please CALL (415) 626-0461, EMAIL AT: INFO@HYEGRAPH.COM or stop by 3 Embarcadero Center, San Francisco, CA. 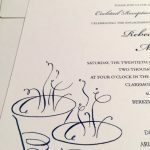 Hyegraph & owner Jacques Oskanian would be happy to help you with your calligraphy designs.